It's another negative headline for the readers — and makers — of news. The Mid-County Memo, a community newspaper serving the Gateway and Parkrose neighborhoods of East Portland, has printed its own front-page obituary. Publisher Tim Curran cited "rising expenses" and "declining income" as primary drivers for ending the print edition, which was mailed monthly to 15,500 households and available at news racks, libraries and local businesses for more than 33 years. "After carefully considering options for the Memo's future, it became clear that this was the step that had to be taken," Curran said in a note to readers. "My own proximity to retirement age tilted the decision." Curran said the paper's website and social media pages will remain active, but the presses will stop forever after inking the 20-page January edition. Neighborhood journals have long filled a niche for readers who want to know what's happening next door — not just at City Hall. With its gaze directed decidedly east of 82nd Avenue, the Memo reported on an impoverished section of the city that some say is overlooked by elected leaders. The final Memo includes original reporting on a plan to develop 32 acres of farmland near Northeast 122nd Avenue, a follow-up on a delayed affordable housing project and an investigation into a "lingerie modeling shop" suspected of being a front for less savory activities. Some of the articles were not immediately available online, as Curran says the paper typically staggers its digital publication dates. But readers have already taken to the paper's online pages to reminisce and offer condolences. "Thanks for your dedication to sharing local news," the Parkrose Educational Foundation wrote in a tribute to the paper. "The Memo will be missed." "We will miss your focused coverage of the issues and events important to East Portland," added Human Solutions in an online statement. 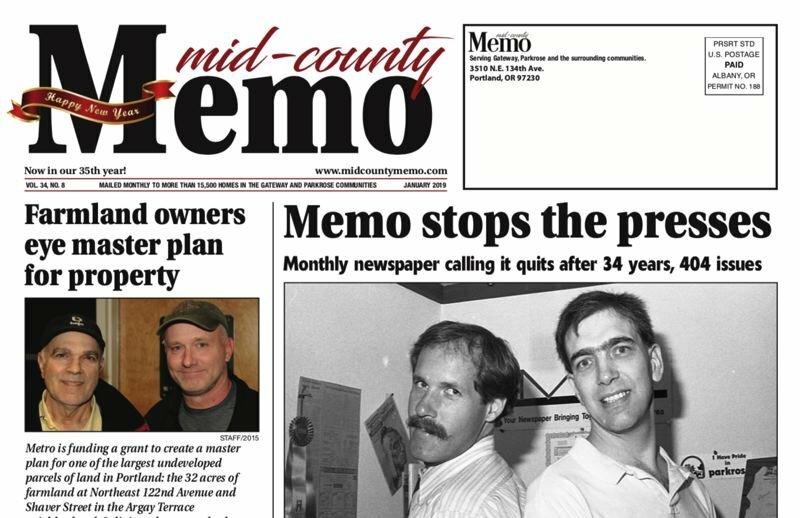 Tom and Marcia Pry founded the Mid-County Memo in May, 1985, adding it to a stable of six other hyper-local publications. Now, only three remain: the St. Johns Review, Hollywood Star and the (Pamplin Media Group owned) Sellwood Bee. Curran published the newspaper for 27 years after purchasing it from the Prys, and worked alongside a small staff of reporters, freelancers, advertising sales reps and designers. Retirement is bittersweet, he said: "I'll be just another old, fat, bald white guy in the crowd decrying what the city has done to East Portland."